One of the earliest Disney movies I can remember seeing in theaters is Sleeping Beauty. It has always been one of my most favorite Disney films and features one of the scariest villains I think the studio has ever invented: Maleficent. So when I found out that a live-action film centered around Maleficent was scheduled to be released in 2014, I stalked every news article, interview, and Facebook status update about the film. Not to mention that I have spent years collecting Maleficent merchandise such as T-shirts, wallets, and even a glasses case. 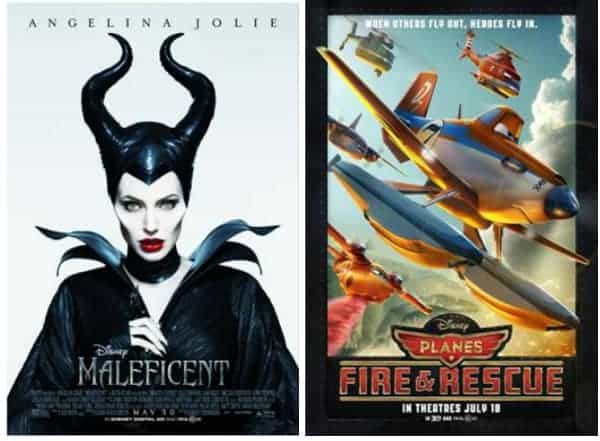 I have some pretty exciting news to share: in less than a week, I will be soaring off to Los Angeles for an action-packed three days centering around Disney’s Maleficent (in theaters May 30th, 2014—you can even pre-order your tickets ) and this summer’s release of a sequel to Planes, entitled Planes: Fire and Rescue (in theaters July 18th, 2014). I hope you are just as excited for each of these films as I am! And if you haven’t yet heard about either film, check out their theatrical trailers now! Lucky you! This sounds like so much fun! I am really looking forward to Maleficent. She’s my favorite villain too! Maleficent looks soooo good! I want to see this bad! Love Angelina Jolie! I am really excited about Maleficent. I have been waiting to see this one for a long time. How exciting for you and I am a little jealous. I am excited for you!! Have fun!! You work hard and deserve some interesting things to do and this sounds like one!!! Have fun!! Can’t wait to see Maleficent when it hits theaters! That will be so awesome. My son really want to see Planes:Fire & Rescue, so we are really excited for July 18! Wow lucky you!! you are going to have an amazing time, I can’t wait to see Maleficent, looks like it’s going to be an awesome movie!! Have a great time!! Oh that’s is awesome! Lucky you! Hope you have fun. 🙂 Enjoy the trip. I love Disney movies, especially watching them with my daughter. I’m especially fascinated by the villains. Angelina Jolie is perfectly cast in the role. My son CANNOT wait for Fire and Rescue to come out, enjoy!! That’s so wonderful that you get to be a part of this! Can’t wait to see the posts! How exciting and fun for you! Let us know how Maleficient is, that movie looks great! I am really looking forward to seeing Maleficent. Congratulations on being invited to the #MaleficentEvent and the #FireandRescueEvent, I look forward to reading your review. Sounds like a lot of fun – what a great opportunity.